This research-to-practice toolkit offers practical solutions for transition coordinators, educators, and others who want to implement community service activities that build skills for youth with ASD. This publication addresses career exploration . Other publications in the toolkit focus on social skills and self-determination. Soft skills are applied skills that are critical to employment success such as communication, enthusiasm and attitude, teamwork, networking , problem solving and critical thinking, and professionalism. Opportunities to build soft skills necessary for work. Teamwork. Students worked collaboratively throughout the planning and implementation of their community service projects. Students had to negotiate with one another about how to complete assigned tasks, practice patience and communication with others in preparation for the service project. Teachers explained how students needed to make decisions as a team and work together during the service project. Perseverance and follow-through. 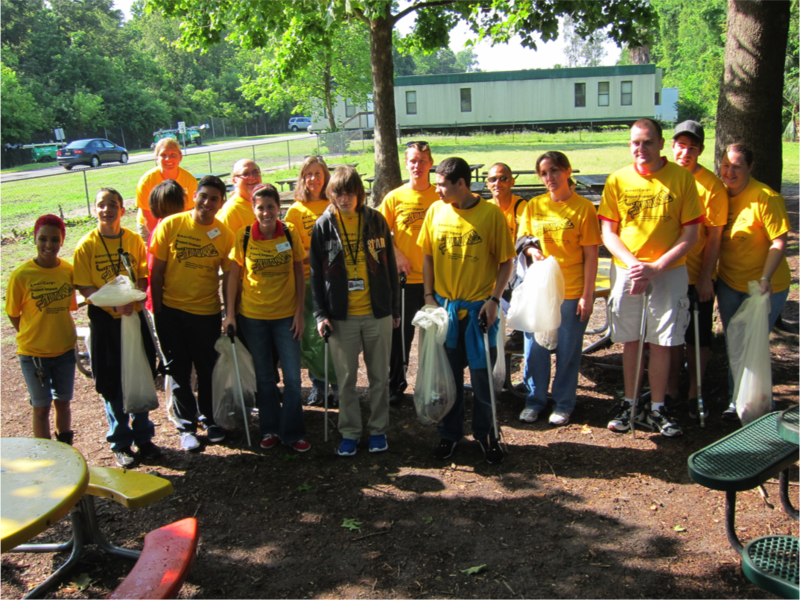 During the service experience, students were required to complete tasks assigned by those in charge. This enabled them to practice listening skills, and accept ownership for following through on their responsibilities. .
Interpersonal skill building. Students met new facilitators, mentors, and people out in the community. They had the opportunity to practice interacting and social skill-building with these new people including maintaining eye contact, engaging in proper introductions, not interrupting when others are talking (e.g. saying “excuse me”) and hand-shaking. These are especially important skills considering the unique characteristics associated with ASD. Furthermore, students needed to practice these skills in unfamiliar environments and with unpredictable routines, which can be especially anxiety-provoking. Opportunities to explore new work-related options and ideas. Exposure to new experiences. The service experience exposed students to new ideas, new aspects of their communities, and new options for work. One facilitator noted that simply seeing a warehouse with forklifts was a new and interesting aspect of their community that they had not seen before. Another example was the zoo, which created a previously unrecognized career option for students, many of whom were interested in working with animals. During a classroom visit from a zoo staff member, students listed all the various jobs at a zoo from ticketing agents, to parking lot attendant, to gift shop clerks; most of which these students had never considered before. Expanding or clarifying career options. Exposure to new experiences helped to expand students’ interests or horizons, or even help to clarify potential employment goals. With this exposure, and some intentional time and effort, several students were able to articulate what they might want to do in the future. In other words, the exposure to new ideas stimulated the development of future goals. Now let’s consider ways to ensure that your community service experience includes career development and career exploration. As facilitators of community service projects, remaining aware of intentionally integrating processes and activities that support career development and career exploration is critical. This includes not only offering opportunities to build employment skills, but also making a clear link between the identification of those skills and how they can be used in future employment. Intentional matching of students to the service activity. In a collective activity such as group service projects, facilitators cannot create completely individualized placements. However, consider choosing a service activity that at least some of your students are interested in. Maybe it’s gardening and nature or maybe it’s working with animals. This allows them to not only expand their network by meeting new people, but meeting new people from whom they may later seek employment. Effective matching is also more likely when the community service location is assessed prior to the actual project so that students’ accommodation and support needs are addressed in advance as much as possible. Schedule meetings and reflection activities that focus on the skills student are acquiring during the service project. Facilitators can complement the service experience with regularly scheduled meetings, trainings, and workshops, as well as reflection activities that focus on the transferrable professional skills youth participants are acquiring during the service project. Reflection is an activity that typically occurs as part of the service effort where participants consider the impact of the activity and what they have learned from participating. Taking the time to ask youth participants to articulate what they learned allows them to relate these skills to their future jobs. Students can then list such skills on resumes and highlight them in future job interviews. Don’t forget that soft skills are also important. Provide youth the opportunity to practice soft skills while serving (communication, job etiquette, problem solving, travel training, networking, time management, responsibility) and then make sure they can describe the skills they have learned and how they relate to work. Students in the Service Works project benefitted greatly from hands-on activities that incorporated the use of pictures rather than words. In one reflection activity, students were asked to draw a timeline of the service planning meetings and eventual service activity, including start dates and “the finish line” or the service project. After each meeting, students cut out pictures representing skills gained (i.e. I shared an idea today, I listened to others’ ideas, I raised my hand when I had a question, I met someone new, etc) and pasted them on their timelines. 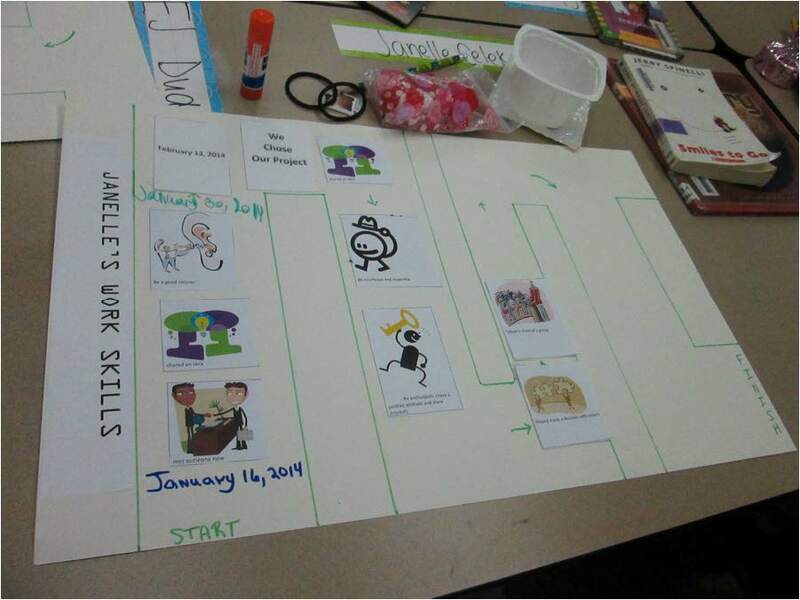 This activity allowed students to identify new skills, created a visual log of those skills, established a mechanism for sharing those skills with others, and acted as a tool to increase continuity of information in between service project planning meetings. Have a post-service transition period. At the conclusion of the community service experience, facilitators can create a post-service transition period focused on learning how to obtain and retain a job. This training can include topics such as mock interviews, role-playing, resume writing, networking, and talking about disclosure of disabilities and workplace accommodations. This transition period should also incorporate awareness of job accommodations as well as community-based employment resources for students and families as the students exit high school and seek permanent employment, such as vocational rehabilitation (VR). Each student’s VR counselor can help to translate the value and benefit of the service experience to the student’s employability and resume development. Incorporate other career development activities into the project. Facilitators can incorporate other informal career development activities, such as job shadowing and career-focused mentoring into the community service planning and implementation. These activities should emphasize career exploration and soft skills acquisition. Mentoring is recognized as one of the most important strategies for assisting youth in making a positive transition into adulthood. Career-focused mentoring provides young people the opportunity to get a glimpse of the world of work that may not otherwise be available to them. It also allows them to gain and practice skills that are useful in professional and other settings, and to prepare for life as an adult. Career-focused mentors can share employment success strategies, provide employment-related guidance and networking support, and act as a reference. The Office of Disability and Employment Policy’s Career-Focused Mentoring for Youth: The What, Why and How offers an overview of the technique and its impact on youth. In addition, the National Collaborative on Workforce and Disability for Youth developed a guide entitled Paving the Way to Work: A Guide to Career-Focused Mentoring. Designed for older youth, this guide is intended for individuals designing mentoring programs for youth, including youth with disabilities, in the transition phase to adulthood. Community service for transition-age youth with ASD is a great way to make a big difference in the lives of others, all while your students are developing work skills and exploring potential career paths. Our study described how community service had an impact on job development skills necessary for future employment and community inclusion. Through consideration of the above strategies, your students can explore careers in your local community, and can practice meeting new people and building relationships, all while filling a critical community need. "Skills to Pay the Bills: Mastering Soft Skills for Workplace Success," is a curriculum developed by the Office of Disability and Employment Policy focused on teaching "soft" or workforce readiness skills to youth, including youth with disabilities. It focuses on six key skill areas: communication, enthusiasm and attitude, teamwork, networking, problem solving and critical thinking, and professionalism. The National Service to Employment (NextSTEP) project offers a toolkit designed to incorporate career development activities into community service. The toolkit offers activities, strategies and resources to help build career development in the context of service.